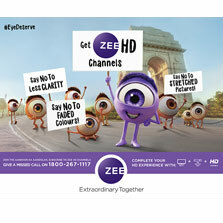 Zee Entertainment Enterprises Limited (ZEEL) the leading media & entertainment powerhouse, launched its new campaign 'Aankhon Ka Aandolan' to build awareness about the benefits of a High-Definition (HD) channel viewing experience and drive a behavior change. With multiple players having pushed the HD subscription, its penetration still stands below 10%. With this new campaign, ZEEL aims to drive consideration to upgrade from SD to HD subscription amongst the current SD subscribers. The campaign 'Aankhon Ka Aandolan' showcases the trouble that the eyes go through and the reason why they are out on streets to protest. The campaign further aims to educate viewers who would have heard about the HD experience being better but are not sure how it is significantly superior to what they are currently experiencing. Launched in partnership with the country's top DTH platforms like Tata Sky, DishTV, Videocon d2h, Airtel and cable platforms, the campaign aims to actively drive HD channel upgrades during this festive season. Hence, the creative campaign has a clear Call-To-Action with a missed call number that will allow consumers to opt for their DTH partner or call their cable operators and enquire on the HD offers available. The core idea of the campaign is led by strong consumer insights that address the inferior experiences that the SD channel viewers are currently settling for – Less Clarity, Faded Colours & Stretched Pictures. Along with the SD viewers, the campaign also reaches out to those HD viewers who believe that HD viewing is only relevant for specific content, whereas HD experience is an overall upgrade to a superior quality viewing world. Conceptualized by the company's creative partners Lowe Lintas, the campaign aims to be the trigger to upgrade to HD subscription by showing the consumers, the superior quality HD viewing experience that they are missing out on. 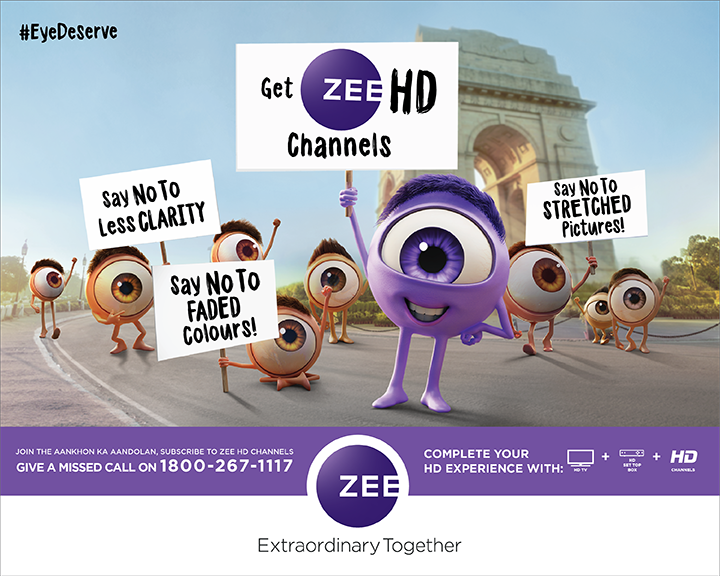 ZEEL currently offers 14 HD channels. With the revised MRP price point regime that is expected to come into play in a few months from now and the changing consumer behavior pattern, the viewer will now be able to independently choose HD and SD channels separately giving them the power to upgrade to a superior viewing experience. Commenting on the launch of the 'Aankhon Ka Aandolan' campaign, Ms. Prathyusha Agarwal, Chief Marketing Officer at ZEEL said “At Zee, we believe in offering 'Extraordinary Entertainment' to our consumers at all levels. Where we focus on offering versatile content for consumers across age groups, we are equally invested in offering them superior quality viewing experience through our best in class HD technology. We truly believe that HD viewing experience offers our viewers better clarity, and once you get hooked on to it, you just can't do without it! We have tailor-made our two brand films in 8 languages and given it legs to appeal to our regional viewers spread across the country. The benefits of the HD viewing experience has been brought alive through the lead protagonist across regional markets of the ZEE network. Zee Entertainment has launched a 360-degree marketing campaign influencing the consumers across their path to purchase journey. The media mix strategically uses 'TV, DTH, and Out-of-home' to build awareness, 'Digital' to influence behavior and an aggressive 'Retail' promotion to trigger conversions at the point of purchase of the HD TV set. The high impact retail push is in association with the biggest electronic stores in the country such as Reliance Digital and Vijay Sales, during this festive season. Alongside, the company will also be seeding the campaign across Samsung and Panasonic stores in collaboration with Dish TV. The campaign is promoted through the strength of the network with 35 channels coming together to achieve a reach of 40 Mn viewers ably supported by our digital push with an estimated reach of 45 mn across the campaign period up till Diwali. The Digital campaign has been designed to reach out to the SD viewers across platforms that they have used to either show interest in purchasing HD TV sets, make subscription payments or upgrade their lifestyle. The SD & HD subscribers will be targeted not only through the DTH & cable platforms but also through our network's vast social media assets. Innovative marketing formats have been used across social media and Out of Home to bring alive the tension points – example, usage of Uber cab windows to bring alive the 'clarity' difference between SD and HD channels.